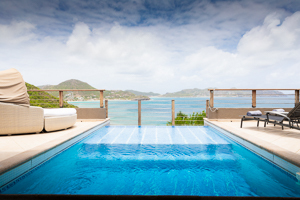 Perched high atop one of the most chic areas in Pointe Milou, St Barts sits Villa UJV 158, also referred to as C'est la Vue, is a 2-bedroom villa with sweeping views of the Caribbean and surrounding islands. You will enjoy lots of sun and spectacular sunsets while lounging on the terrace or relaxing in the pool. The quality furnishings have an eclectic contemporary flair. Each master bedroom is air-conditioned and comes complete with technological amenities. The living room is completely technologically equipped. A fully equipped kitchen and a Weber gas barbeque are at your command should you tire of St. Barts fabulous restaurants. Beach chairs, an umbrella, and coolers are available so you can enjoy the beautiful white sand beaches of St Barts, which are only minutes away. If you need to burn those extra calories from over-indulging in fine foods, there is a gym with a great ocean view on the lower level. It is complete with elliptical trainer, Nautilus Freedom cross trainer, Hoist leg equipment, weights, and bench. Airport greeting and daily maid service (except Sundays and holidays) await your arrival. At villa UJV 158, it is all about the view and spectacular sunsets! 12 years old. Non-walking infants permitted.